Those who have read Peter Ackroyd’s Dan Leno and The Limehouse Golem will recall that the word golem comes from the medieval Jewish for an artificial human being brought to life by supernatural means, a “thing without form”. Ackroyd’s latest book, London: The Biography, has itself managed to breathe life into a seemingly formless city – a tangible sense of London as a living organism permeates this remarkable work. Indeed, even the endpapers show “seven phases in the evolution of Old London Bridge, 1209-1831”, perhaps a subtle reinforcement of his idea that London is a living organism, that it has a “human shape”, echoing the seven stages of man. 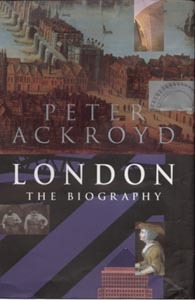 London: The Biography rings with the city’s peculiar echoic quality which Ackroyd is always attuned to. He writes that the London Eye has its precursor in the 17th century at Bartholomew’s Fair, and that following the GLC’s abolition in 1986 “in effect London resumed its ancient life, with the separate boroughs affirming distinct and different identities”. Temporal simultaneity to Ackroyd is as real as the Thames, flowing through time as well as space. He is quick to point out that “contemporary theorists have suggested that linear time is itself a figment of the human imagination”. Indeed, his book itself moves “quixotically through time” forming a labyrinth, and can be explored from a multitude of entry points. The book is arranged into themes such as London as theatre, crime and punishment, London as crowd, London’s radicals, and for every main thoroughfare of London: The Biography there are scores of delightful or macabre side streets to wander down. Take the following list of synonyms for prostitutes, which reads like a bizarre incantation: “… smuts, cracks, mawkes, trulls, trugmoldies, bunters, does, punchable nuns, molls, Mother Midnights, blowzes, buttered buns, squirrels…”. Within each theme we have Ackroyd’s compendious learning tripping the switches between past and present. He is no Eric Hobsbawm or Asa Briggs, he is neither ideologue nor pedagogue, instead it is through anecdote and vivid description that we are led through labyrinthine London. Of course, any thesis that London, as it were, imprints itself on its citizens is going to occasionally sound overblown: “London drives some of its citizens mad. A psychiatric survey in the Seventies revealed that cases of depressive illness were three times higher in the East End than in the rest of the country”. But these criticisms, like pointing out lacunae, miss the point, for in a very real sense, as he himself says at one point, there are 7 million versions of London being written everyday. This is very much the book that Ackroyd has been building up to, or even the one that he was born to write, prefiguring it in his biographies (Blake, Dickens) and fiction (The Great Fire of London, Hawksmoor). London: The Biography doesn’t just have sources, it has an essay on sources, and at over 800 pages you might be forgiven for buying the audio version read by Simon Callow (who is also, incidentally, appearing as Dickens in Ackroyd’s The Mystery of Charles Dickens). Ackroyd has put in a heroic amount of research, and it would be churlish indeed to disabuse his book of its definite article.